Save: Time, Hassle and Money on your next New Vehicle. Looking for a great deal on any NEW make or model vehicle? 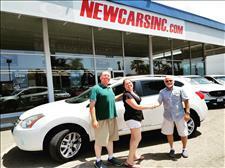 California Coast Credit Union has New Cars Inc. to make new vehicle purchasing easy. Click below to tell us the vehicle you are interested in! Save up to .50% off your California Coast Credit Union auto loan when you purchase your next vehicle through New Cars Inc. Looking for a great deal on a pre-owned vehicle? California Coast Credit Union has teamed up with New Cars Inc (NCI) to offer Weekly Auto Specials. Click the button below to see this exclusive list of specially priced vehicles.! - Give us a call at (800) 748-5747 or CLICK HERE and we’ll contact you. - Let us know the make, model, color and options of any make or model of new vehicle that you desire. - We’ll search and negotiate on your behalf, taking advantage of all dealer rebates and incentives…passing those savings on to you. - We can have your vehicle delivered to your home, office or credit union branch. Delivery can take as little as 30 minutes of your time. Need to sell or trade in your present vehicle? Click Here for Cal Coast Financing!